Three years passed since Mizrahi family drove to fateful Seder night. Special interview with widow Hadas Mizrahi. Three years have passed since the Mizrahi family went to Seder night at the mother Hadas' parents' home in Kiryat Arba. A burst of shots from an accursed terrorist killed the father of the family, police Assistant Commander Baruch Mizrahi. In an interview with Arutz Sheva, Hadas tells of how she endures, chooses life, and perpetuates Baruch's memory: "Three years since the attack. The hardship and the pain remain. We as a family decided to march on. The children grow and flourish and look forward. One of the things I have taken upon myself since the attack is to go and encourage police widows and victims of terrorism," she says. "Unfortunately, in the past three years, there have been many widows and orphans. The support and progress we make with the families gives us strength to continue and eventually see good things." "Baruch's not being here is felt all the time," says Hadas sorrowfully, "Just on Purim was one of the boys' birthday, one of the children enters first grade, every Shabbat and holiday to see the empty chair without Baruch is hard. On the other hand, I look at the great miracle we had: 45 bullets hit the car. I was seriously wounded and my children were wounded, and today you see us all looking forward and seeing their life and their laughter every day - it gives me the strength." Since the attack does Seder night take on another meaning? "Seder takes on a different meaning. Baruch is not here, but all the tradition and special things we did with Baruch continue. We also do a play of the Exodus that combines what happened to us as a family. And despite the adversity and the empty chair, we chose joy." How does commemorating Baruch affect you and your family? "Baruch is present in daily life. Only this week the police held a parade in his memory and I see young policemen who did not know Baruch, today tell about Baruch's legacy. In various schools, too, they learn about Baruch's good deeds. They also dedicated two Torah scrolls in his name; a community, a school, and a street in the city of Modi'in are called after his name. Commemoration gives strength to continue. My children will not remember much of their father but they will remember all his good deeds and all the things done in his memory." You said in an interview to Arutz Sheva that had terrorists not been released in the Shalit deal, Baruch would be alive today. Has the government changed its policy on releasing terrorists? "Government policy has not changed. We demand the death penalty, especially for terrorists released in the Shalit deal. We demand the expulsion of terrorists and the demolition of houses without fighting the High Court of Justice. Those who come to do violence will receive a death sentence and their families will be expelled and will not receive any benefits from National Insurance." 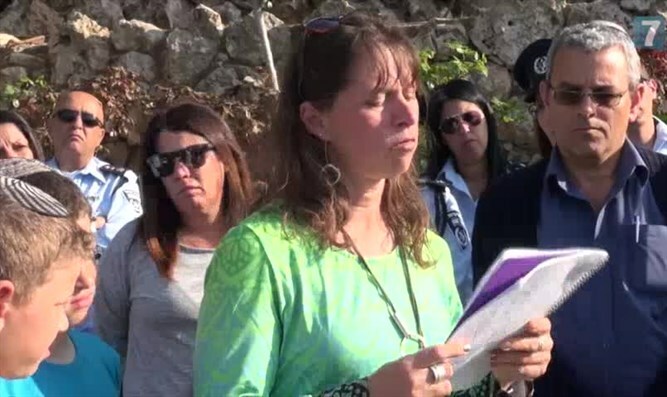 At the end of the memorial ceremony, Mizrahi said on her husband's grave: "That's how you left me, empty; I did not have a minute to understand that this means goodbye, that's how you left me longing."